That's great. Unfortunately, it seems this integration broke the ability to reply to Youtube comments since January. Reportedly, deleting your Google+ profile is the only way to fix it. Oh, and my girlfriend can't even join my Google+ hangout because Google don't like her name. That feature's not yet available here in the UK. Yes,it is. It hit my account sometime last night. It probably just didn't roll-out to yours yet. I don't see this. I have been wanting this ever since it was announced and still I don't see it in my settings. What do I do? Same for me Mr Anonymous... I also don't have the option... but today I use Firefox on Android (nightly version) and when I went to the advance options, the dialog come up... Because this is a floating dialog, I couldn't make the process. typo: "For example, other people that know you will find your YouTube videos much easier if you're using your full name and your photo." should be "For example, other people that know you will find your YouTube videos more easily if you're using your full name and your photo." Also, pet peeve: "...other people that..." is becoming accepted usage instead of the more friendly: "...other people who..."
I don't see the option in US. I can't see the option in US. I used to see this option but no longer do. The option does not exist. FAIL. I still can't see this option.. Yes this program seems to have been abandoned after only a few days by Google. Then why does it still say "Note: We're gradually rolling this out to our users. 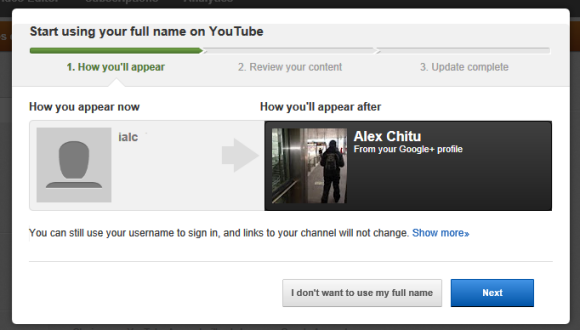 When it's ready, you’ll see this option in your settings, or when you upload or comment on YouTube."? I went from Google+ to youtube (without username) so I made a username for easing url searching and being able to sign in. But now I can't switch back to full name. How do I do this? Fix it Google. Info on it. I accidentally clicked on the update button, and I DON'T want to use my real name AT ALL, is there any way can fix this? When I tried to switch my account to my real name, Youtube told me that my name was not acceptable and it would not let me use it.